The Ministry of Production – the Cites authority responsible for protecting species threatened by global trade – certified the fin loads of a group of traders under suspicion for alleged trafficking of species, organized crime and tax crimes. An important supplier of this input in Peru, he was arrested because he was part of an Ecuadorian mafia while he was processing a Cites permit to import tons of fins. A group of Peruvian merchants under suspicion for alleged illegal trafficking of species and contraband sent 1,700 tons of fins of various shark species to Asia for US $ 25 million between 2014 and 2018 (almost 40% from Ecuador). Today the exact amount that entered and left Peru with the permission of the Ministry of Production (Produce), responsible for issuing the certification of the Convention on International Trade in Endangered Species of Wild Fauna and Flora, known worldwide as Cites, for its acronym in English. The Cites – agreement between governments of 182 countries and the European Union to conserve wildlife through the regulation of trade – seeks to make the purchase and sale of species sustainable, legal and traceable. In Peru, the administrative authorities of Cites are the Ministry of Production for the case of hydrobiological resources (such as the shark), the Ministry of Agriculture for terrestrial flora and fauna, and the Ministry of the Environment, as a scientific entity, among others. Peru is one of the 10 main exporters of shark fins with an average of 340 tons per year, of which a large part comes as land import through the border with Ecuador (where directed fishing is prohibited) or through fishing vessels in international waters; while a smaller amount comes from the national fishing, according to Produce and the National Superintendency of Customs and Tax Administration (Sunat). JANUARY, 2019. Customs intervened the cargoes of different companies exporting shark fins between November 2018 and February 2019 in the port of Callao. The story behind the investigation we presented came after Customs intervened a record load of 48.5 tonnes of shark fins (corresponding to 50 thousand unique specimens) between November 2018 and February 2019, in the largest operation to be remembered against national companies that buy and export shark fins of suspected suspicious origin and under the cover of the Cites permit issued by the Ministry of Production. After the investigations, identified almost all the people behind the companies intervened by Customs since the end of 2018 and established a list of the largest exporters since 2014. In addition, established its contacts in the direction of Produce responsible for comply with the CITES Convention for the trade in shark fins, as well as the contradictions detected between the import figures from Ecuador to Peru and its subsequent dispatch to Asia. Finally, the Peruvian Mario Lucio Maceda Vidal (Tumbes, 1951) was identified as one of the largest importers of fins from Ecuador -200 tons brought to Peru by his wife and his company Genesis Naomi, and supplier of Lima exporters. 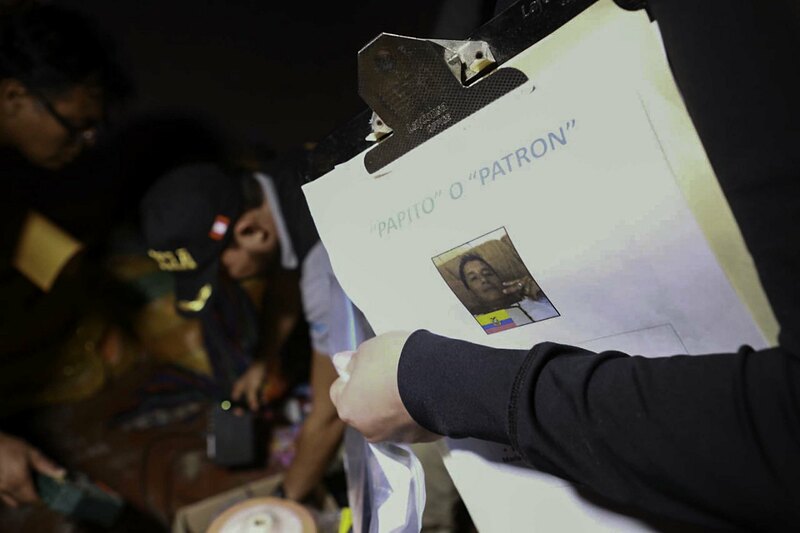 According to the National Police, this personage integrated a criminal organization called “Los Piratas de Puerto Pizarro” , accused of the theft of fishing charges and murders on the northern border. By the time he was arrested, in October 2018, Maceda was processing a Cites before Produce permit. ORGANIZED CRIME. 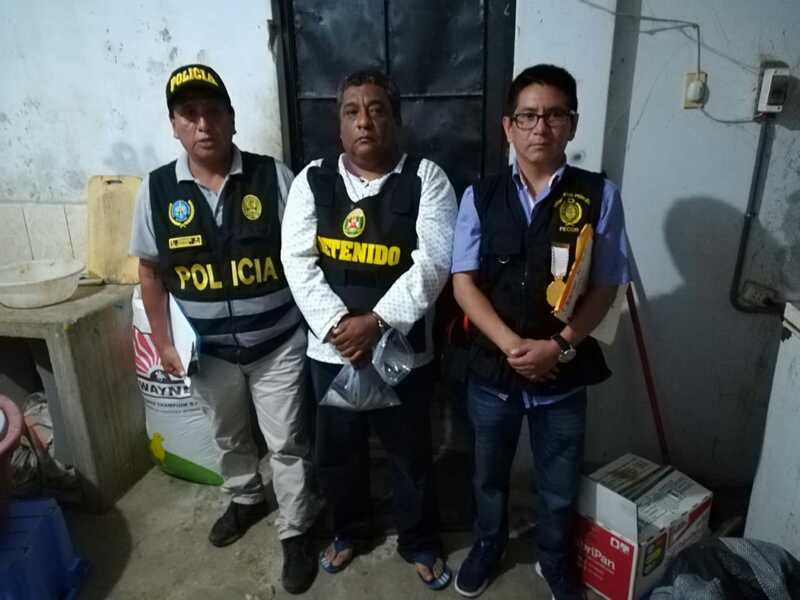 ‘Don Mario’, the largest importer of fins in Ecuador, was arrested in Tumbes during a gigantic operation against the Ecuadorian band nicknamed ‘Patrón’. Almost in the last decade the fin export business has been concentrated by a group of people with operations in the ports of Callao and Tumbes, among which the Chinese citizen Xiaoou Zheng (Shangai, 1964) who as a natural person stands out or through Lamarqocha Inversiones (of which he is a shareholder) and Inversiones Sancco (where he has been appointed as agent since 2014 together with manager Amadeo Sáenz Astuñaupa), sent 670 tonnes of shark fins to Hong Kong between 2014 and 2018, for US $ 12 millions. Xiaoou Zheng, known as Elizabeth Zheng by her environment and nationalized Peruvian in 2003, is married to businessman Jieang Liu Jiang, of Eastern descent and a member of the China Jiangsu Chamber of Commerce in Peru. Xiaoou Zheng -dueña with her husband of real estate in San Isidro, Surquillo, Chorrillos and Cañete- is linked to the export of shark fins to Asia for more than a decade through other companies in Lima: Minami Trading (1997) , Dowell (2005), Inversiones UPC (2009) and Mayuqocha (2015). In 2011, one of these companies, Inversiones UPC , was intervened by Customs and the Police while it was in the process of sending its cargo of shark fins and seahorses to Hong Kong. Meanwhile, the other exporters of fins linked to Xiaoou Zheng were registered in one of its Surquillo properties: from Inversiones Sancco (whose main shareholder is a deceased person, Primo Sáenz Romero, and his son Amadeo as manager), until Minami Trading, Dowell and Mayuqocha. After Xiaoou Zheng, who concentrates almost 40% of the total sent between 2014 and 2018, appears Enrique Jaramillo Martínez, who through the companies Exports JME and Full Mont sent 90 tons of shark fins to Hong Kong for more than US $ 3 millions in that time. Other important exporters are the members of the family group integrated by Jorge Eduardo Castillo Silva of the company Huiman and his son Jorge Renzo Castillo Martínez of Angaff with 65 and 32 tons of shipments of said resource to the same destination, respectively. PUERTO DE MANTA. Companies from Ecuador send tons of shipments of shark fins to Peru. Customs of Peru has detected contradictions between the figures that leave the neighboring country and those that finally enter the national territory. Also on this list is Miguel Ángel Vera Chevez, who operates in Tumbes and exported 31 tons of fins to Hong Kong through I & E Fish Peru, Investments and International Businesses EcuaPerú and Marea Blue. Vera Chevez is also one of the strongest importers in the country. Others that stand out are: Adán Vise Chunga with New Products Food and Juan Roberto Quispe Huamaní with Inversiones Flippers; who sent respectively 27 and 28 tons as a natural person or through their companies. After the last investigations of , the authorities have placed under suspicion one of the biggest importers of fins from Ecuador between 2014 and 2018 and at the same time key supplier of some of the mentioned exporters: the tumbesino Mario Maceda Vidal , who purges 25 months of preventive detention for integrating a Peruvian Ecuadorian criminal organization. According to the police, Maceda, alias ‘Don Mario’, was linked to the mafia leader, the Ecuadorian William Banchón Sánchez ‘Patrón’. ‘DON MARIO’. The Division of Investigation of Crimes of High Complexity (Diviac) captured Mario Maceda Vidal, one of the main suppliers of shark fins, at the same time in which he processed a Cites certificate before the Ministry of Production. ‘Don Mario’ fell on October 22, 2018 as part of a gigantic operation of the Division of High Complexity Investigations (Diviac) in Tumbes. A week before Maceda had written to the Ministry of Production to obtain a Cites certificate that allowed him to import almost four tons of fins from Ecuador through his company Genesis Naomi. Strangely, and already under arrest, the environment of Maceda presented to Produce a power of attorney signed by him to delegate his paperwork to a major exporter of fins that today is under suspicion. By the time Maceda Vidal carried out the Cites en Produce paperwork, the Diviac – an elite police unit against organized crime – had already intercepted the cell phones of the members of their organization and carried out follow-up actions on their daily tasks. Sources linked to the case indicated that this person had close contacts with Xiaoou Zheng of Lamarqocha and Juan Quispe Huamaní of Inversiones Flippers, both being important buyers of their loads of shark fins. Despite all this, the accused of integrating the mafia “Los Piratas de Puerto Pizarro” – for which the seizure of 45 boats was ordered, as well as watercraft, weapons and US $ 12 thousand and S / 56 thousand – ended up receiving good news Produce: your documents were in order to obtain the Cites import permit for shark fin foxes. The Diviac, which seized three fishing vessels of Maceda Vidal in Tumbes, has placed its preliminary attention on the links between these organizations and the trade in hydrobiological products. It was established that ‘Don Mario’ imported at least 12 tons of shark fins from Ecuador thanks to four Cites certificates delivered by the Ministry of Production throughout 2018. In no case was the provenance questioned of their cargoes or their possible links with organized crime. Following this track, the authorities established that these commercial groups have links with companies in the fishing region of Manta (Ecuador), where national authorities have identified the largest number of fin traders in that country; and in Hong Kong (China), destination point of 85% of exports of the product dispatched from the port of Callao in recent years . Other destinations have been Japan and Singapore, also in Asia. At the close of the edition, communicated with the merchants mentioned in this report, but only answered Jorge Castillo Martínez from Angaff Peru. “There is nothing that is absolutely illegal in my work,” he said. In addition, he said he only bought shipments of shark fins from Ecuador from companies that “have ministerial agreement, health certification and CITES permits.” The rest chose not to answer or delegate their version to a lawyer. These commercial groups are also related to a key area in the Ministry of Production for foreign trade in hydrobiological products: the Directorate General of Fisheries for Direct and Indirect Human Consumption(Dgpchdi), which has among its functions the issuance of permits Cites de Protection of aquatic species threatened by global trade. This certificate is essential for Peruvian companies (including those intervened by Customs at the end of 2018) to import, export and re-export fins from Ecuador to Asia. In this area of ​​Produce have been determining the lawyers who acted as directors of Fishing for Direct and Indirect Human Consumption in recent years, as well as the biologist Aaron Canepa Sosaya (32), who signed the certifications Cites import and export revised for this reportage, and fishing engineer Mey Lin Chang Molina (34). This address authorized the import and export of tons of fins for final dispatch to Hong Kong, under a mechanism that is already in the sights of Customs and the Financial Intelligence Unit (FIU). INTERVENTION. The Customs operation that began in November 2018 gave the first indications of how shark fin importing and exporting companies operate. In recent years they have gone through this strategic direction for Cites certificates lawyers Jorge Luis Castillo Figueroa (2017-2018) and Juan Carlos Vargas Gianella (2018 and 2019). Today, Verónica Caballero Gonzales is in charge , who assumed her role with the new management of the Deputy Minister of Fisheries, María del Carmen Abregú Báez . The latter was director of that area in different stages between 2013 and 2015, approximately. Currently, the authorities analyze the historical record of fin shipments from the neighboring country and on the way have discovered flagrant contradictions when comparing the import and export figures between the Customs of Peru and Ecuador. The preliminary conclusion – which was foreseen for isolated seizures made in the Panamericana Norte in the last luster – is shocking: tons of contraband fins have left Callao with CITES certificates approved by the aforementioned address of Produce. In the framework of the production of the report, received the version of Produce in the sense that they do not verify “the criminal record of the persons or companies” that request a certificate or Cites permit for import, export or re-export. of fins, or of any other species included in said agreement, as they have no competence. However, they said that the Dgpchdi verifies its legal origin from the Shark Landing Certificates issued by the Directorate General of Supervision, Supervision and Sanction of said ministry. We also knew the version of some Produce officials, used in the latest events on the topic Cites in Lima. 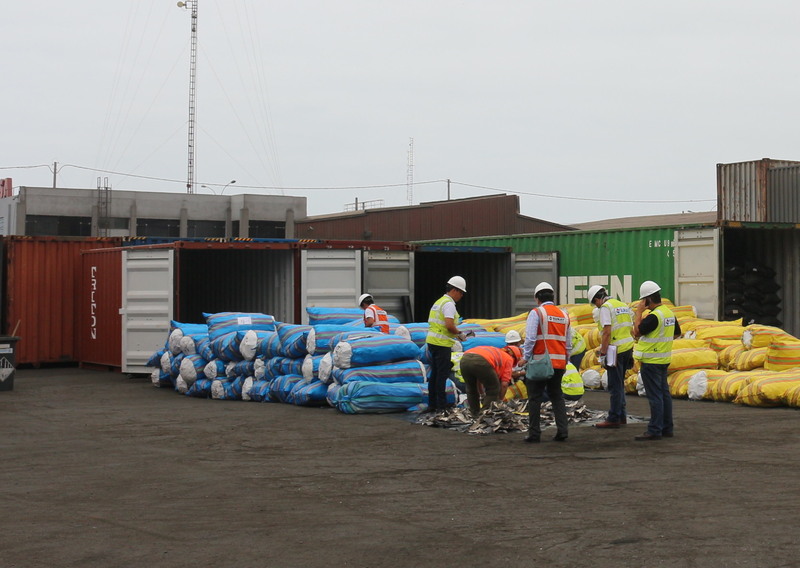 They indicate that the loads of fins arrive to Peru from Ecuador because the merchants of the neighboring country manage to obtain the certificate Cites issued by the authority of their country: the Ministry of the Environment. However, in Peru it has already been detected that said permits, and even those granted by Produce, have formal failures and omissions or that they are processed in record time, as in the case of Mario Maceda, who is currently in prison. La Cites, created to save species marketed by gastronomic, health, tourist souvenirs, cosmetic products or fashion items, will hold its most important event from May 23 to June 3 in Sri Lanka: the Conference of the Parties (Cites Cop18). ) . Today – just 45 years after the entry into force of the agreement – the effectiveness of the authorities that ensure this global agreement for the benefit of flora and fauna is in question, at least in the case of shark fins Peru. The nexus between the shark merchants and the entity in charge of the Cites permits is also evident in the Produce visit register. For example, Xiaoou Zheng went to the ministry almost every month of 2018. Precisely, his usual destination was the Directorate General of Fishing for Direct and Indirect Human Consumption, where he met with Vargas Gianella and Chang Molina; as well as the office of Javier Atkins, vice minister of Fisheries and Aquaculture between April 2018 and March 2019. In his visits to Produce, the shareholder of Lamarqocha Inversiones, and client of detainee Maceda Vidal, was accompanied by Amadeo Sáenz, who serves as manager of that company, to the Directorate General of Fisheries for Direct and Indirect Human Consumption; as to the office of then Deputy Minister Atkins. In September 2017, the same Xiaoou Zheng met with biologist Aaron Canepa, responsible for the Cites permits. Amadeo Sáenz also visited Deputy Minister Atkins’ office and other areas of Produce. The same Maceda of the company Genesis Naomi, presumed member of “The Pirates of Puerto Pizarro”, like other exporters, records constant income to Produce. This character came to visit the then Deputy Minister of Fisheries, Hector Soldi, in December of 2017, as well as other directions of Produce. BORDER. Customs and Fiscalía, Cites entities, as well as the Financial Intelligence Unit (FIU) have been analyzing the case of shark fins. In the operation “The Pirates of Puerto Pizarro” three boats of Maceda Vidal were seized. Sources consulted for this report identified Canepa Sosaya and Chang Molina (who remain in their positions while their superiors are replaced or rotated from time to time) as production ministry officials favorable to the business of shark fin traders, even more so after that Customs intervened their charges at the end of 2018. confirmed this relationship when they learned of a meeting held on January 31 at the headquarters of Customs of Chucuito (Callao). That date the officials in charge of the permits Cites in Produce were together with the shark merchants in a meeting until today unknown to press the customs officers for the tons intervened since the end of 2018. In the appointment in Customs appeared the biologist Canepa Sosaya and the engineer Chang Molina, in addition to Xiaoou Zheng by Lamarqocha Investments; Castillo Martínez for Angaff Perú, Jaramillo Martínez for JME, Vise Chunga for New Products, and Quispe Huamaní for Inversiones Peru Flippers. The shark merchants also had the assistance of the lawyer Verónica Caballero Gonzales, by the Directorate General of Fisheries for Direct and Indirect Human Consumption (superior of Cánepa Sosaya and Chang Molina), and later appointed head of the position; as well as Juan Carlos Córdova Calle, supervisor of the General Direction of Supervision, Supervision and Sanction of Produce ; and Karla Verástegui Castro, director of supervision and supervision of the National Fisheries Health Agency ( Sanipes ). According to the witnesses of that appointment in Customs, the officials of Produce, responsible for issuing the Cites, questioned the customs agents for intervening the 48.5 tons of shark fins since the end of 2018, even though they had their approval . Produce’s defense was obvious: its officials would be liable if irregularities were discovered in Cites papers or any possible indication of charges from smuggling. At the meeting – convened by Customs, according to Produce – was the Ecuadorian Reivel Armando Agurto Moreira, fin trader in Manta. In Peru, this person is a representative of the Vásquez Q Group of Guillermo Vásquez Quiliche. However, Agurto Moreira’s business (who visited the biologist Aaron Canepa in Produce 2018) did not attract the attention of the authorities as much as the fact that his brother Miguel Agurto Moreirawas assassinated in Callao in 2015 while being investigated as alleged hitman of a criminal group . Another of the attendees in favor of the group of exporters of shark fins was Bruno Vieira Portugal, brother of Congressman Roberto Vieira Portugal, today investigated by the Office of the Attorney General for influence peddling when boasting of using his power in the Ministry of Production to cancel a resolution in exchange for US $ 25 thousand . It should be noted that the ruling that sought to nullify the legislator had been issued by the same address that delivers the Cites certificates. Sources of revealed that Bruno Vieira was the spokesman of some of the exporters after the intervention of 2018, always invoking his kinship with Congressman Viera, to request the release of the charges. First, last November before the customs, and then in the first week of 2019, when he showed up with the merchants to complain about the immobilization of the fins, in addition to threatening to call Produce or take the case to Parliament. Finally, Bruno Vieira appeared on January 31 at the Customs headquarters.